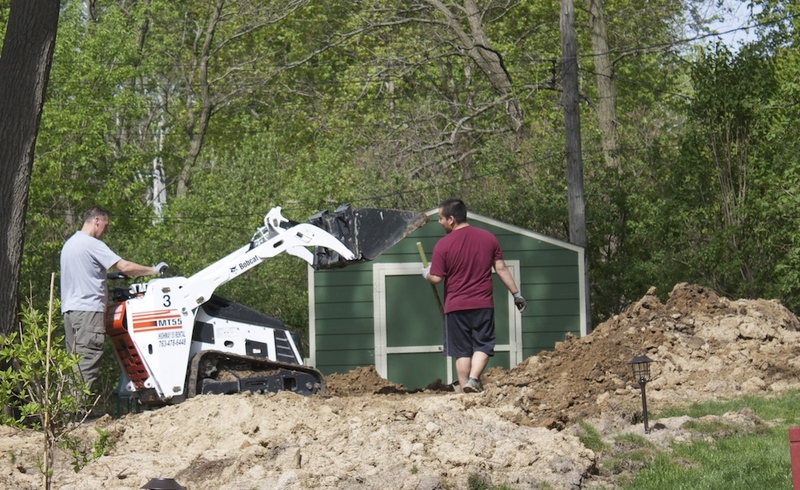 Will the pond digger never stop with the new filtration system??? 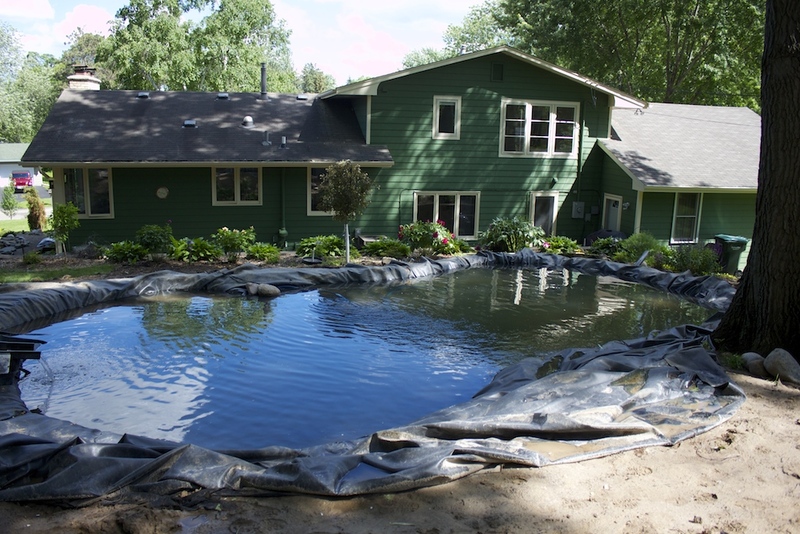 I think the pond water has been looking pretty good since the new system has been in place. 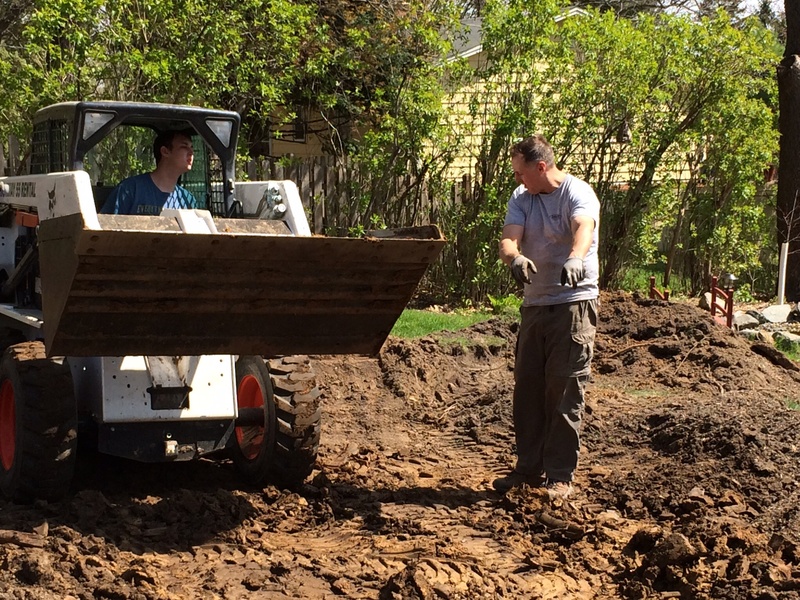 But the pond digger wants to push the clarity envelope. 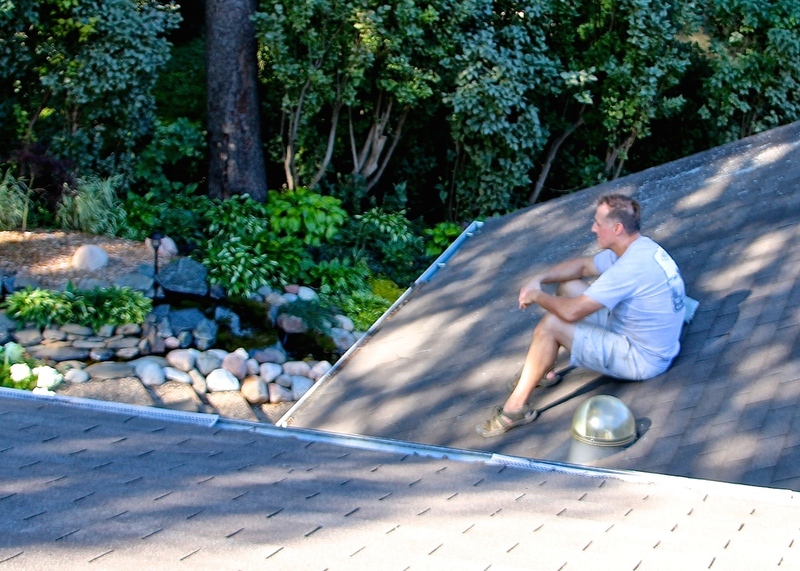 After many conversations with various pond gurus including Matt (Mr. 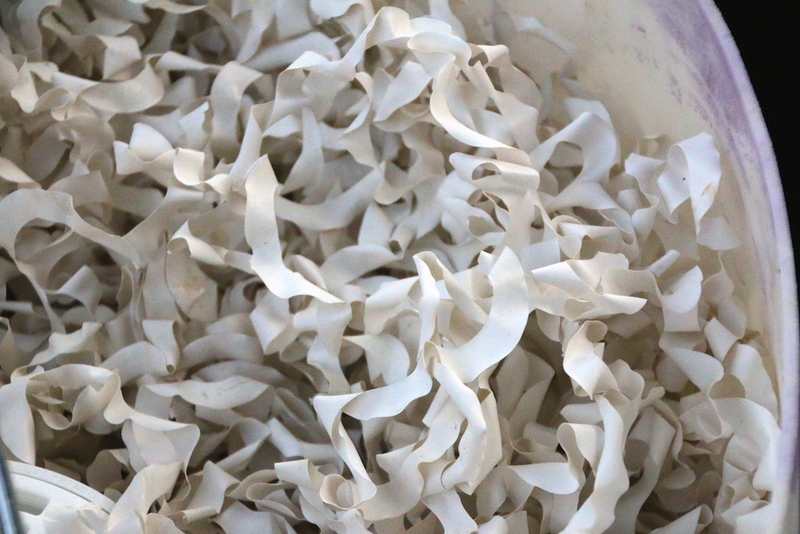 Inventor of Kenzen Koi Food)…Tony orders something called bacti-twist PVC media. Apparently this might be a better option for our system (we’ve already tried bio balls and little bio tubes). Kent Wallace of Living Water Solutions (www.livingwatersolutions.com) was really helpful. Our media came via FedEx in about two days. I’m sure some people find all of this filter stuff fascinating but I like the end result. The water is so clear that I can see the stubborn clumps of string algae that need to be brushed out better. As I was brushing today, I found two little one-inch koi fry in the pond. Who knows what else I’ll find since I can see to the bottom of the pond now…. 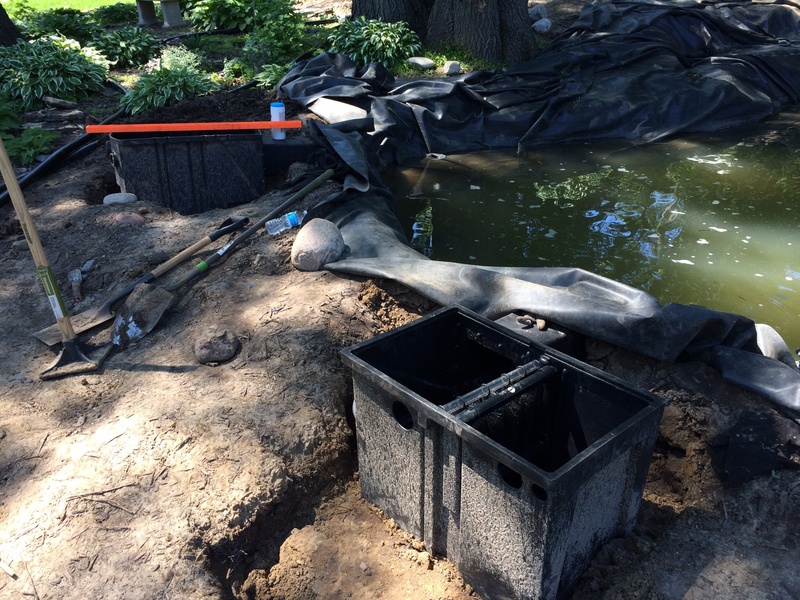 My sweet pond digger was very unhappy at the aesthetics of four skimmer box tops to landscape around…and he keeps looking for the better filtration system. So back to the drawing board with the help of some friends. Now we will be installing a larger container that will hold some biomedia, act as another filter and will also have a waste pump. All this requires a lot of digging. Pond digger came home from Home Depot this morning with a two-man auger. 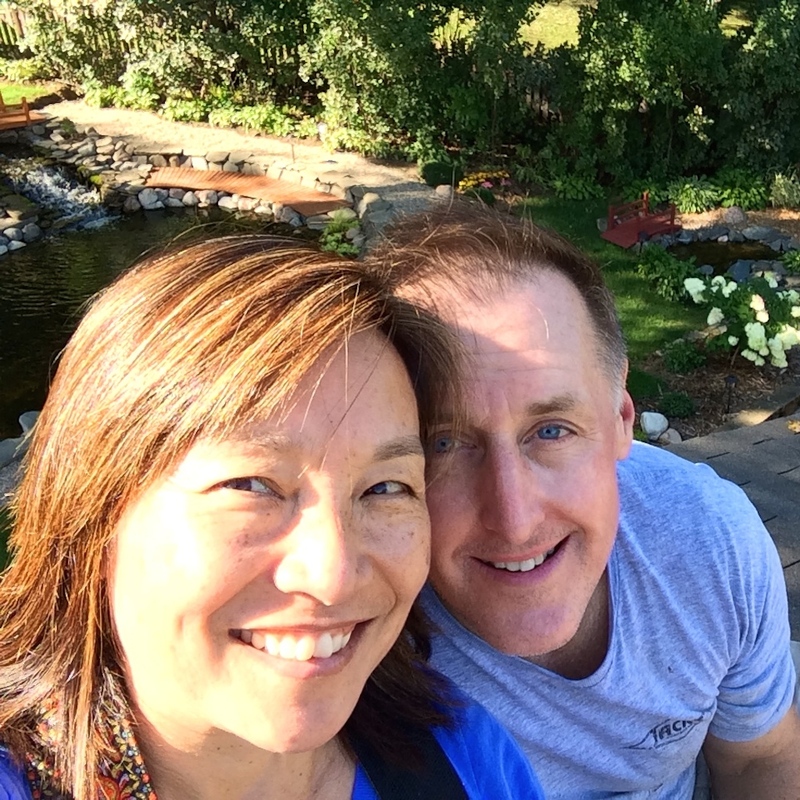 The operative word is two-MAN…not strong person and small,asian lady. 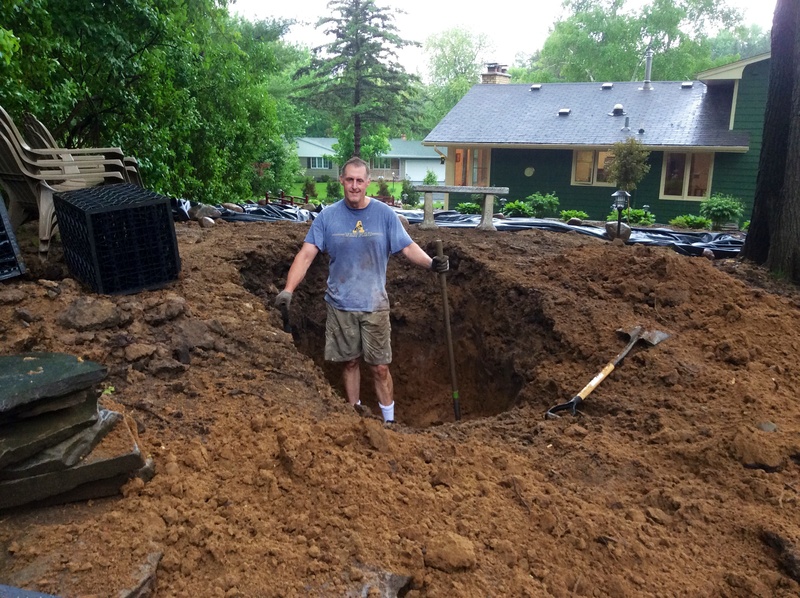 Well we managed to put a dent into the ground and he completed digging a very deep hole (which I happened to fall into an hour later….another story). 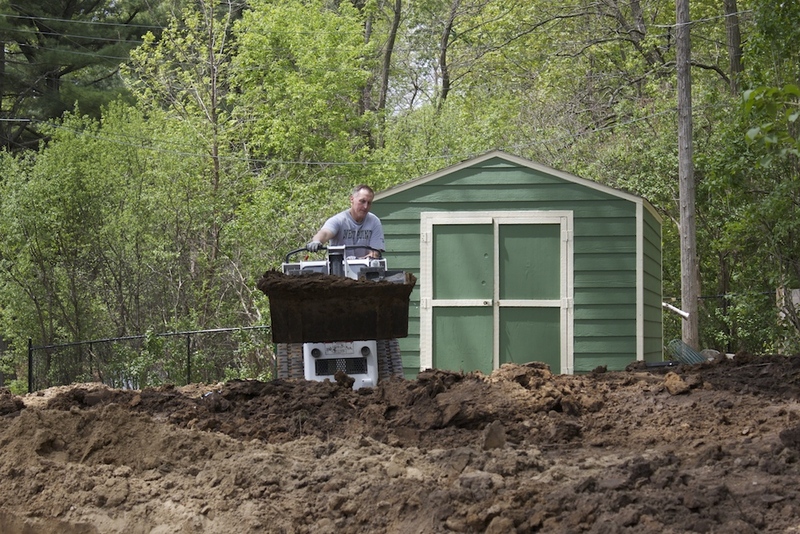 In between digging, a few thunderstorms rolled through creating a very, muddy digger. He’s exhausted tonight. I’m just hoping that we are not doing something else two weeks from now! 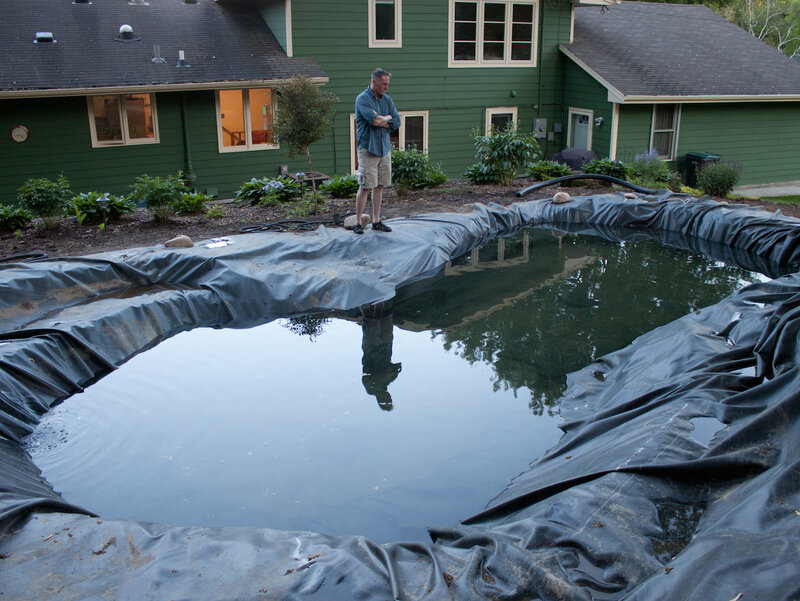 The pond digger is now obsessed with water clarity (this is a good thing). We’ve had string algae taking over the pond, so we’re fighting it with some bacteria and the addition of super sized barley bales. 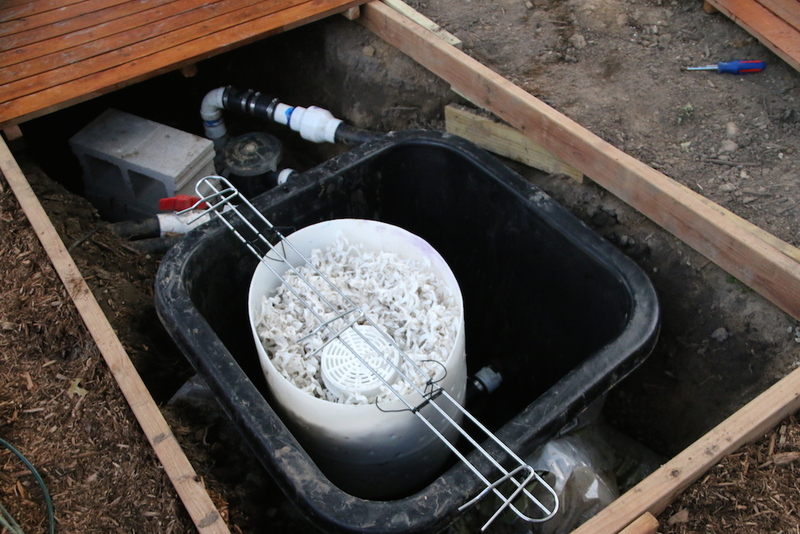 Tony suspected the bottom drains were not working very efficiently so decide to put pumps on each bottom drain. 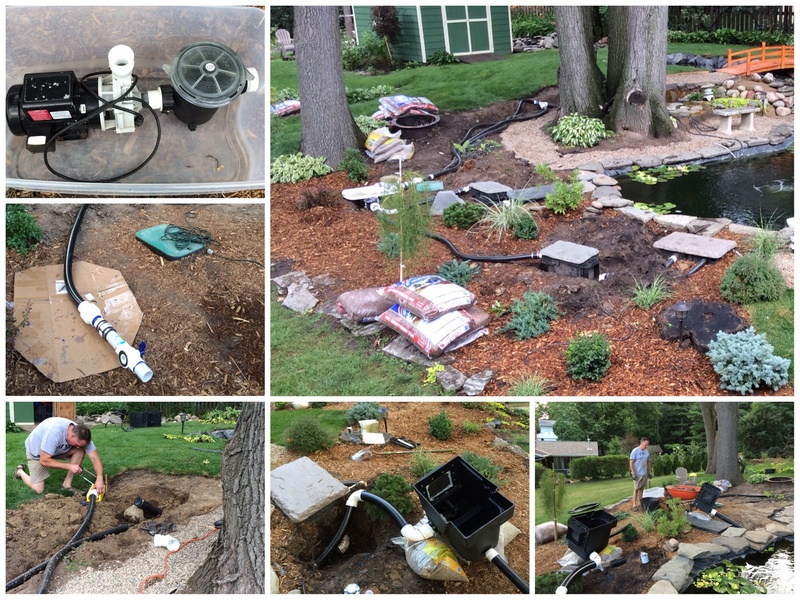 This necessitated digging a few more holes, digging up the return pipe and moving around more plants. I am hopeful this will be a good investment of his time and labor. 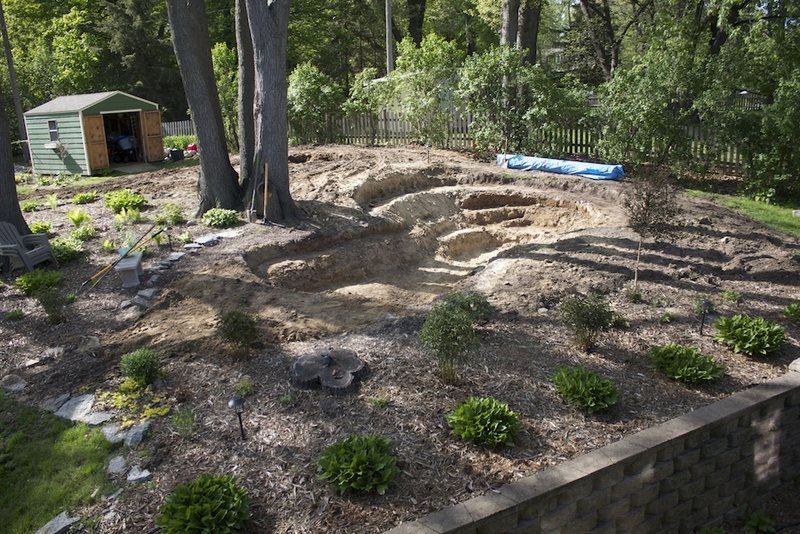 Meanwhile, I have finally gotten back to the landscaping project. 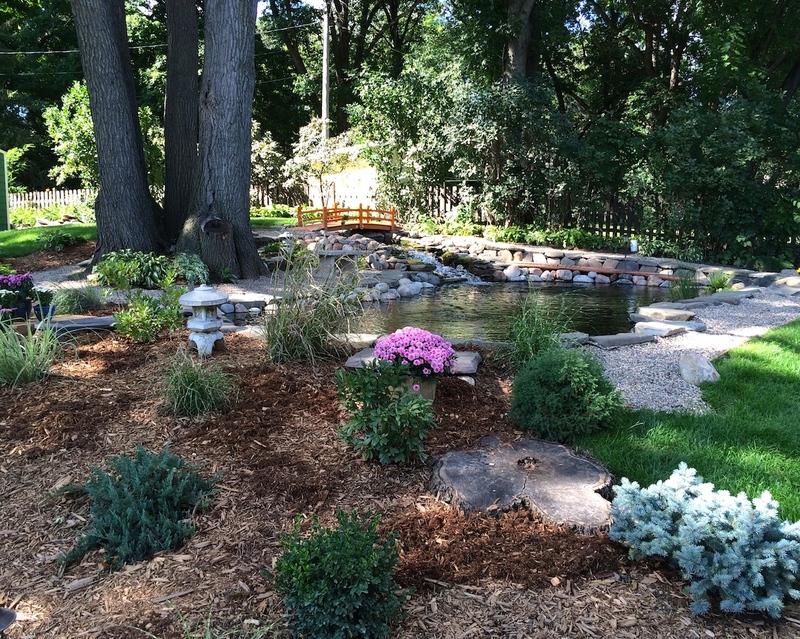 Since my little pond’s landscaping was getting a little overgrown. 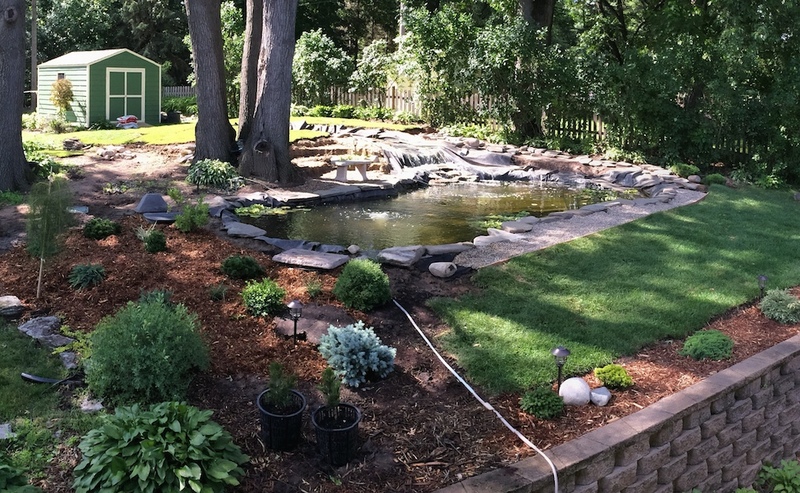 I took some plants from the far side of that pond, dug up ajuga which grows everywhere and some creeping jenny to plant a terraced garden on the hillside coming off of the large pond. 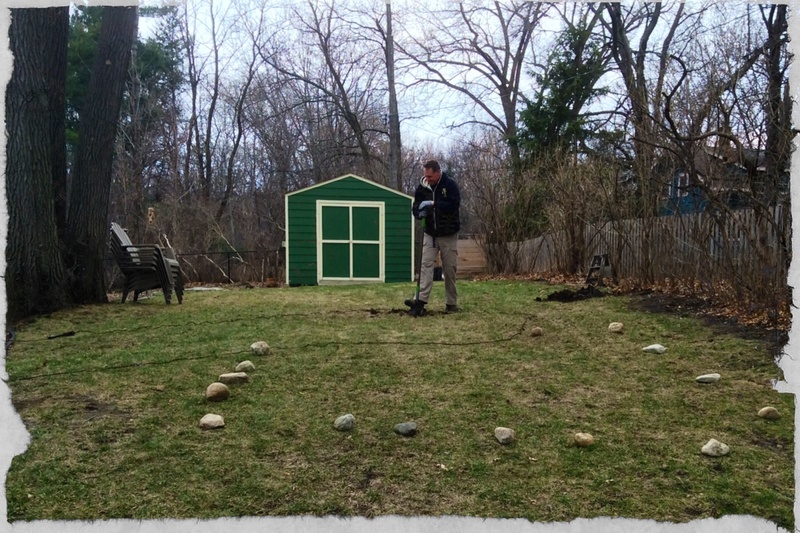 For the last four weekends we have been arranging and rearranging rocks and nothing looked right. 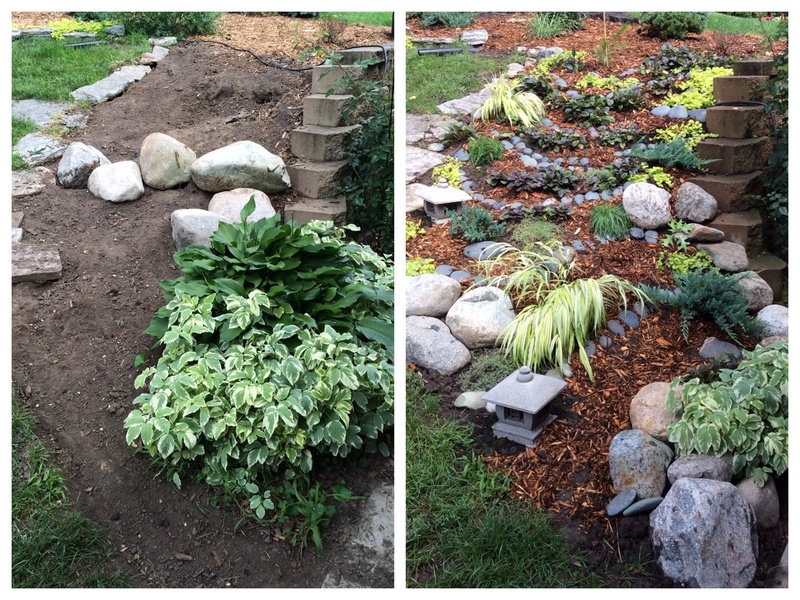 So we went for the terraced look using my favorite mexican pebbles. The hillside was tested with some downpours last night and it held quite well. I’m hoping it fills in a little more before summer ends. 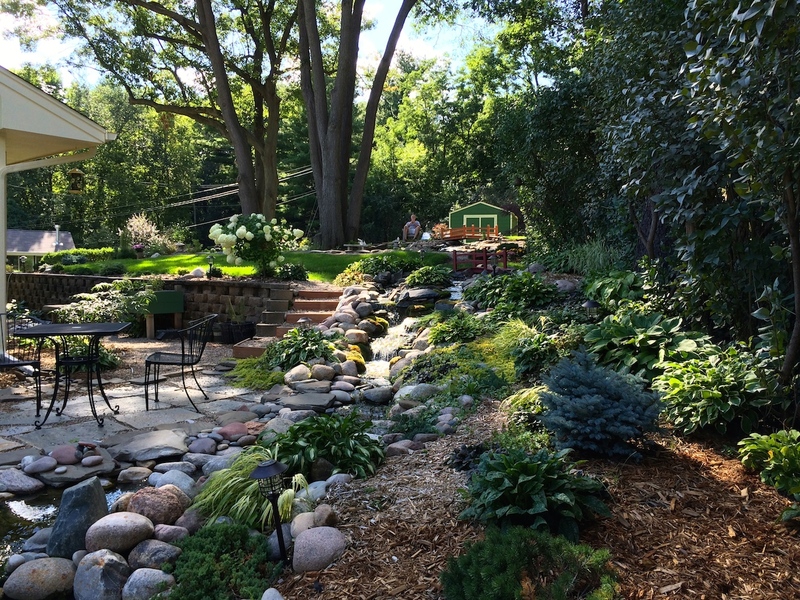 work at the salt mine continues — we’ve added some more grassy area into the yard (primarily because we would rather mow than keep up with the weeding…), put up the bridge, extended the pea gravel path and a number of other details. The end is definitely in sight. I’m looking forward to the rock piles disappearing. Tony spent about an hour in the pond today, cleaning up the string algae. It seems to grow a few inches in a matter of hours. I started another moss project near the bridge – excited to see how it will turn out. We’re getting more areas finished little by little. 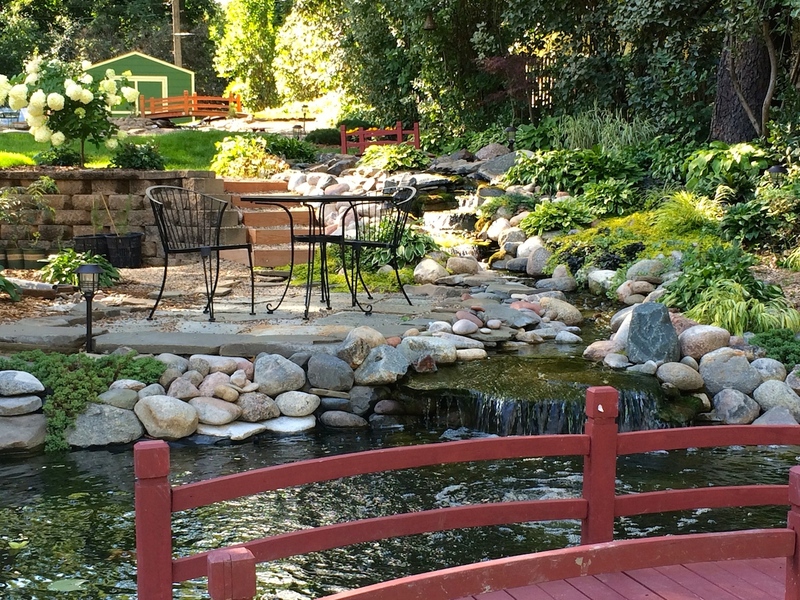 The waterfall seems to take a long time because we set some stones, then decide that it isn’t what we want and redo the arrangement. 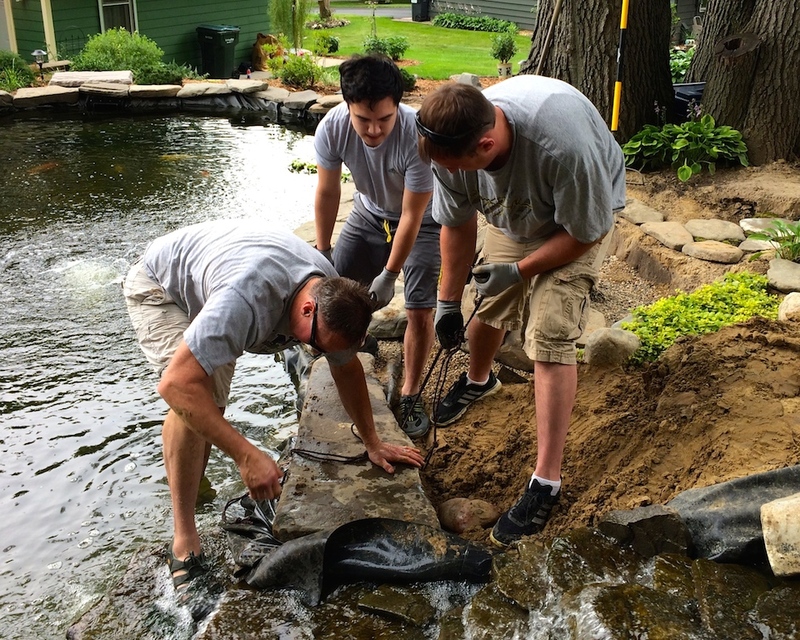 Tony thought we needed a really large stone and found one that weighs 350 pounds or more…good thing we had some extra hands on deck this weekend. 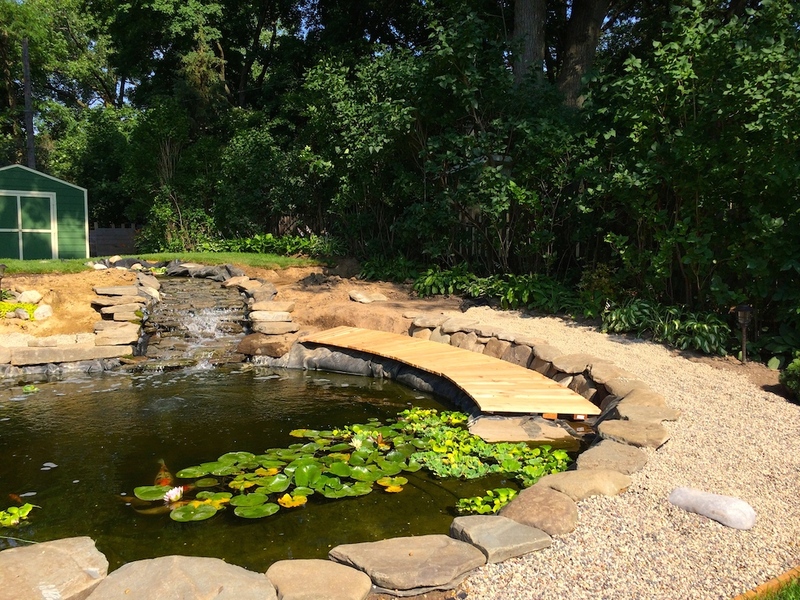 We’ve been thinking about different things to do with the lower shelf of the pond that is out of the water but lower than the path. We decided to go with a little wooden platform of cedar boards. The boards will be stained/weather proofed to match the footbridge that will go above the waterfall. 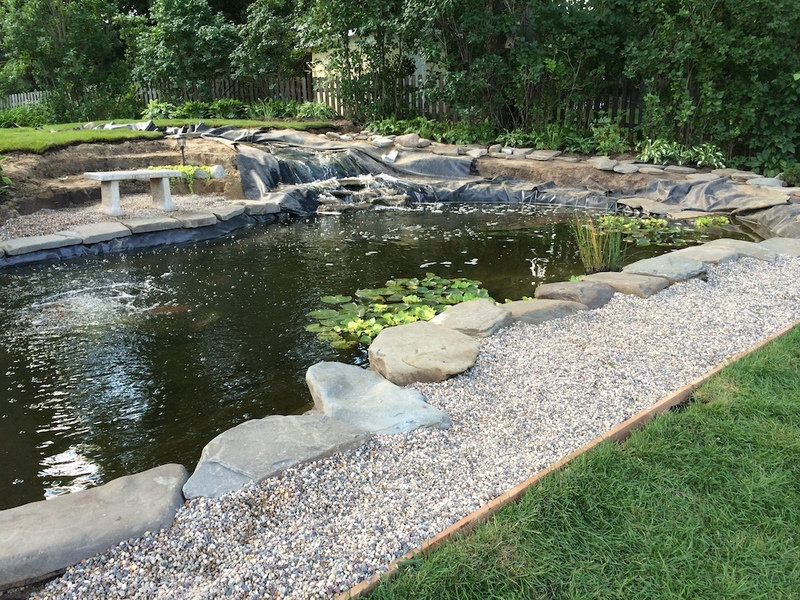 The pea gravel path continues to march around the pond. I also have a spot where I am trying to grow moss between the stones. 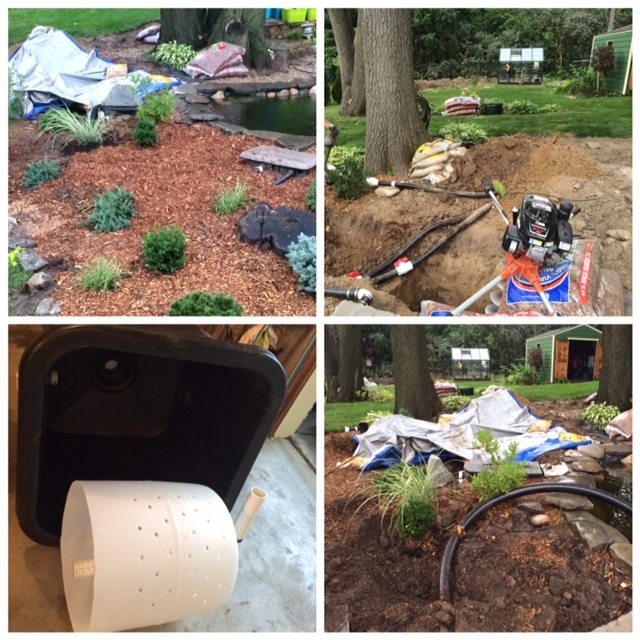 Watering is becoming more of a pain in the neck…. Eager to start work again we had clear skies this morning to pick up 1600 pounds of black dirt, 700 pounds of river jacks and 32 rolls of sod. 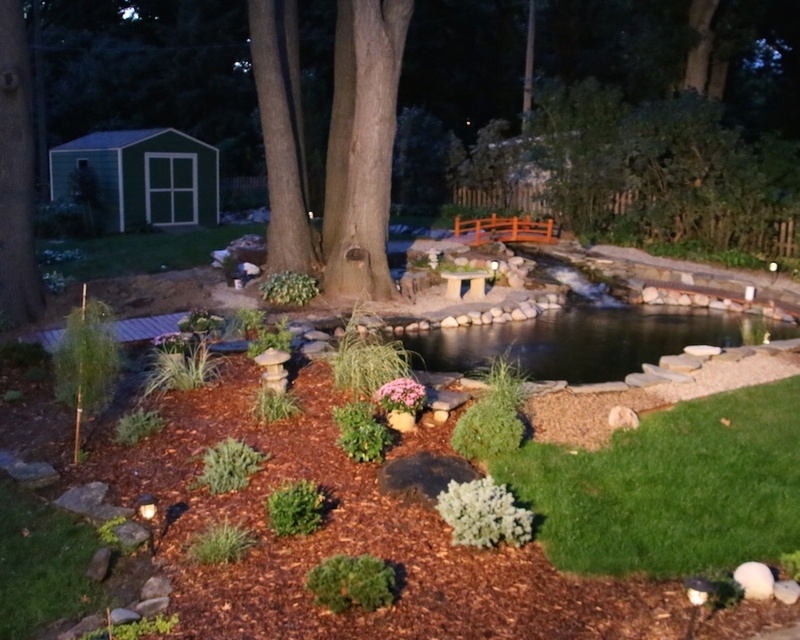 My pond digger has become Mr. Landscaper and through a few thunderstorms we put down some sod and replanted the peonies. I have been busy ordering some new pines to put in – a japanese red pine and some blue dwarf japanese stone pine. I’m wishing we will have some sunnier skies soon! It’s the big day! 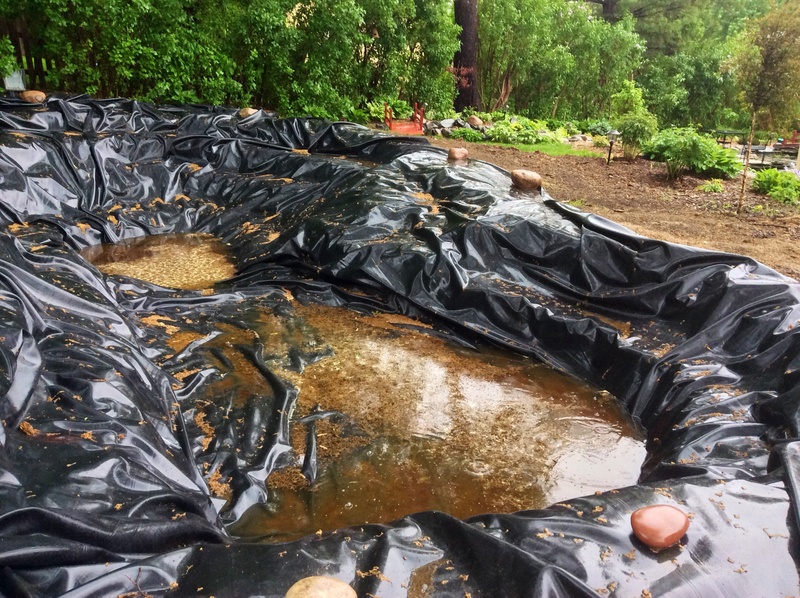 My pond digger is tireless…lowered and re-leveled skimmers, dug out the channel from the bio filter to the top of the falls, filled the place with water and voila! 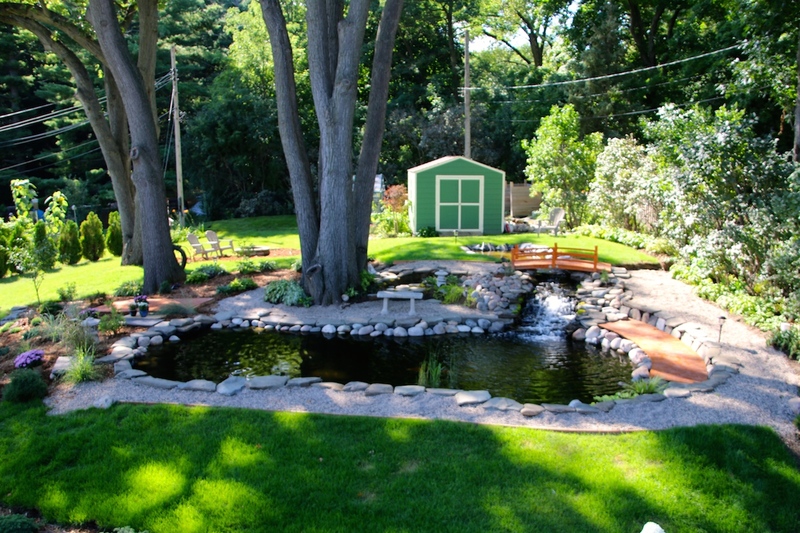 a working pond! 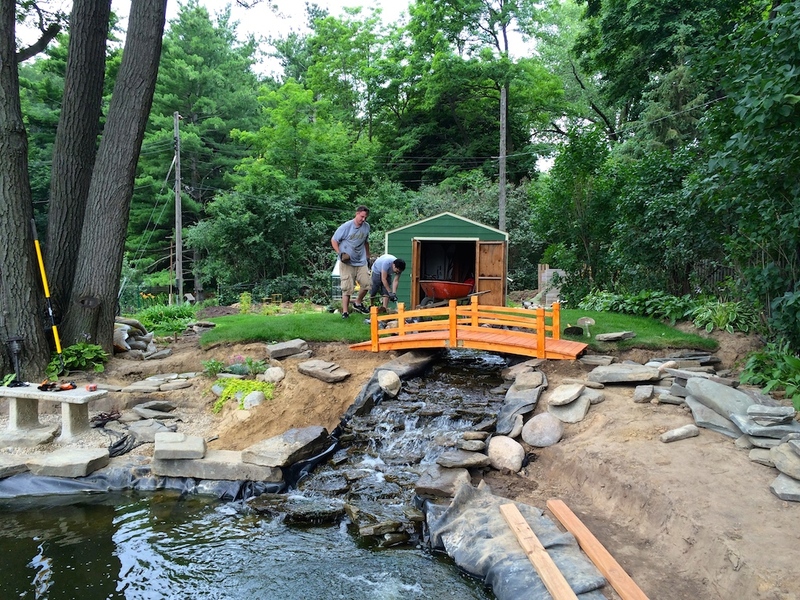 After running the waterfall for an hour we started putting in some of the larger koi. Tito was our canary. 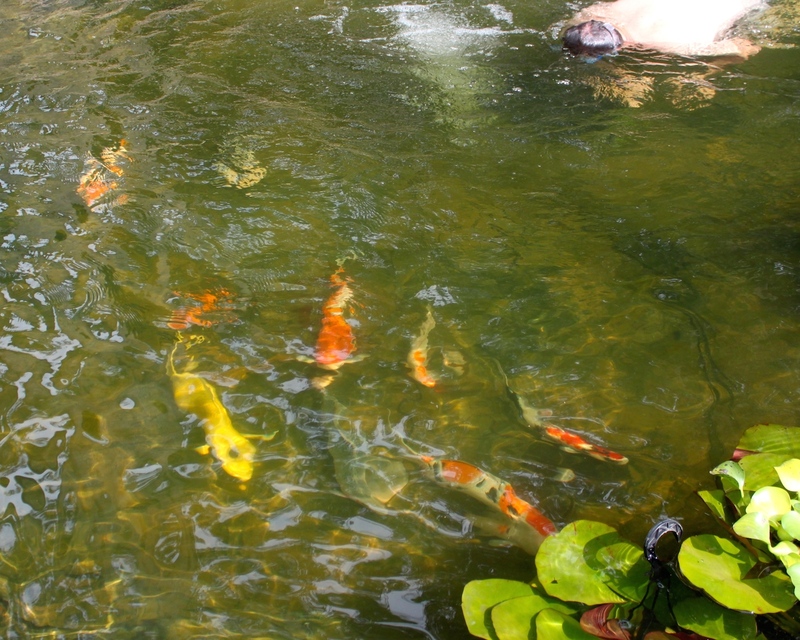 All conventional koi larger than 10″ were brought to the new pond (catching them was quite an operation…) The pond is looking murky with all the dirt getting washed off the sides but it should be clear tomorrow morning. I can’t wait! the first day of summer and it’s a beautiful day! Tony worked on the skimmers today and put in the aerator. 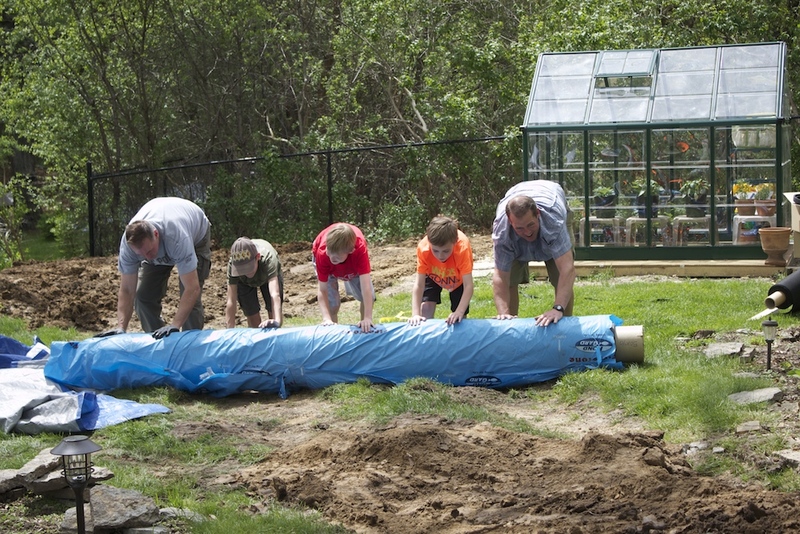 He will be putting the pipes to the bio filter into the ground and for all practical purposes, we’ll have a working pond. 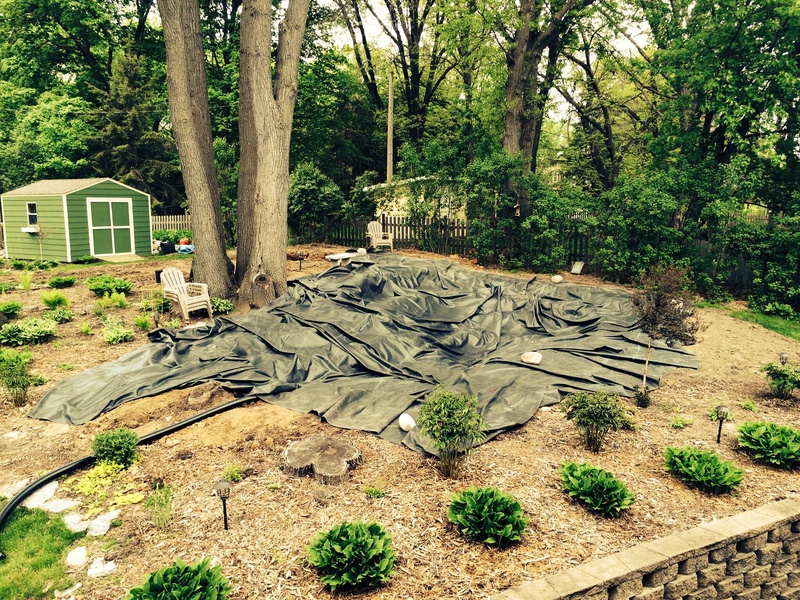 It is a bit dusty but we plan to move the large koi into the pond tomorrow afternoon. 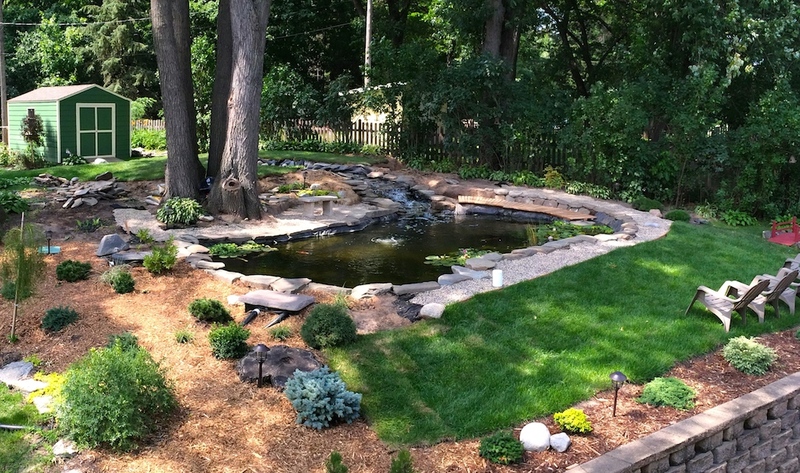 There is still a great deal more to do, but being able to split the koi is a good thing! My pond digger has been very busy. 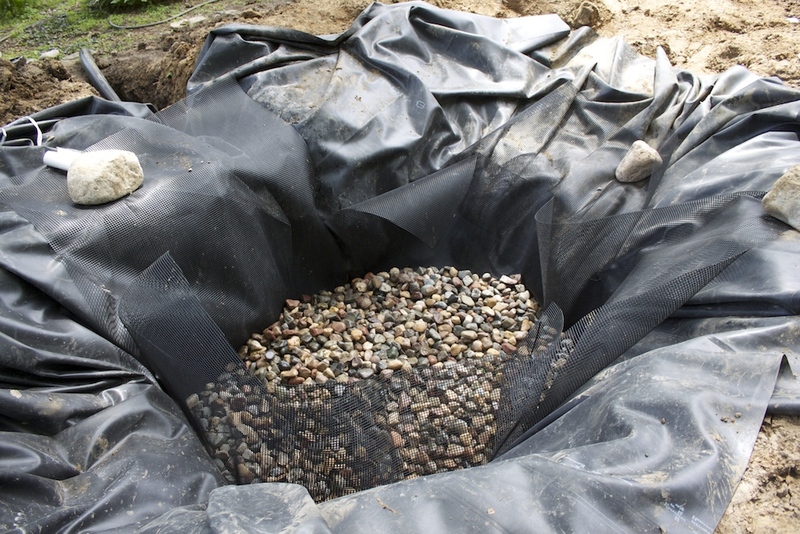 The biofilter is complete and has been filled with a layer of stones. 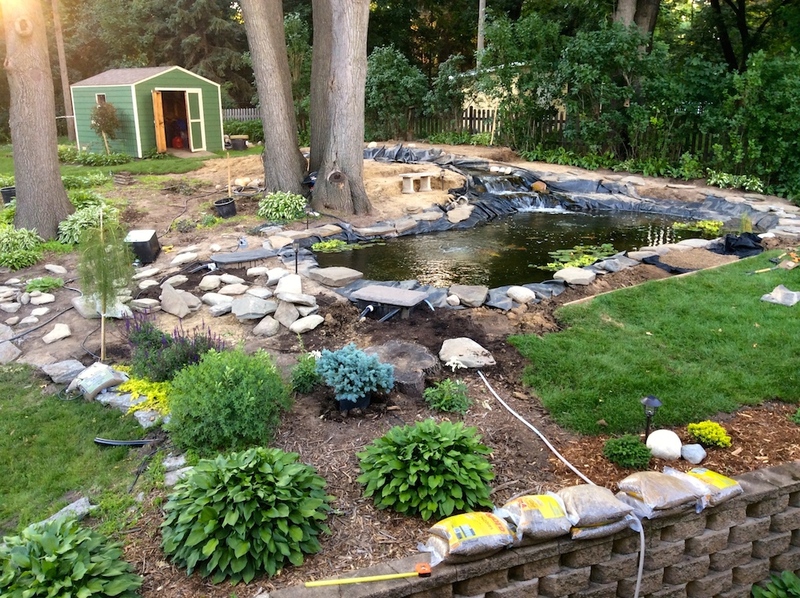 We plan to have it look like a little pond above the waterfall. 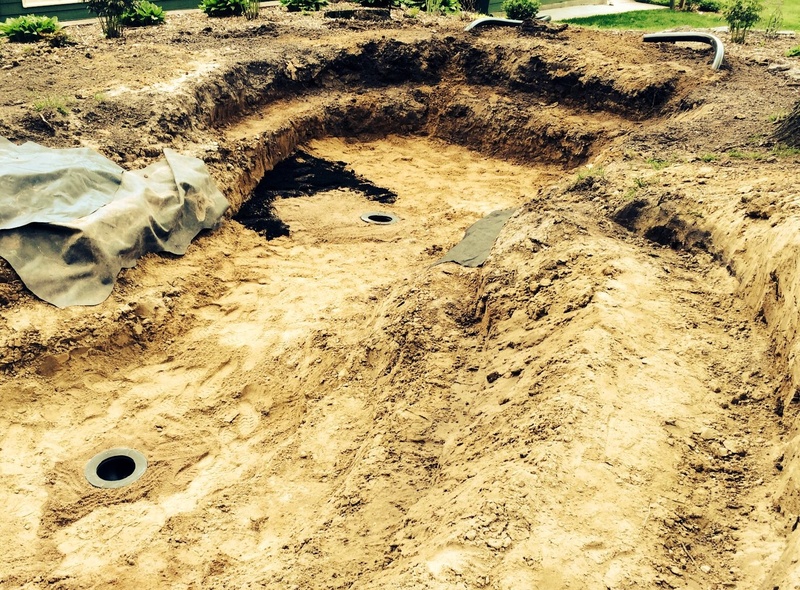 We have been filling up the pond to see where the water level will be and fixing the sides. 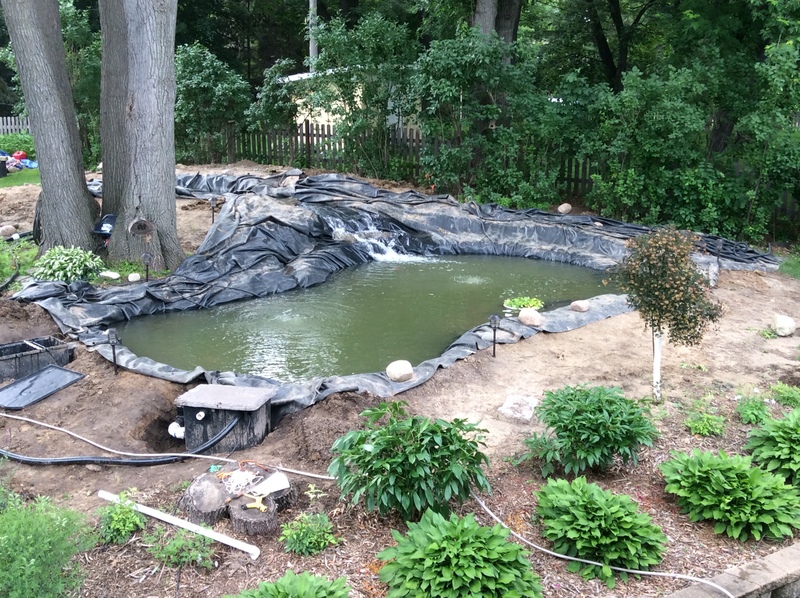 The new pond is measuring 16.5′ wide and 29′ long. 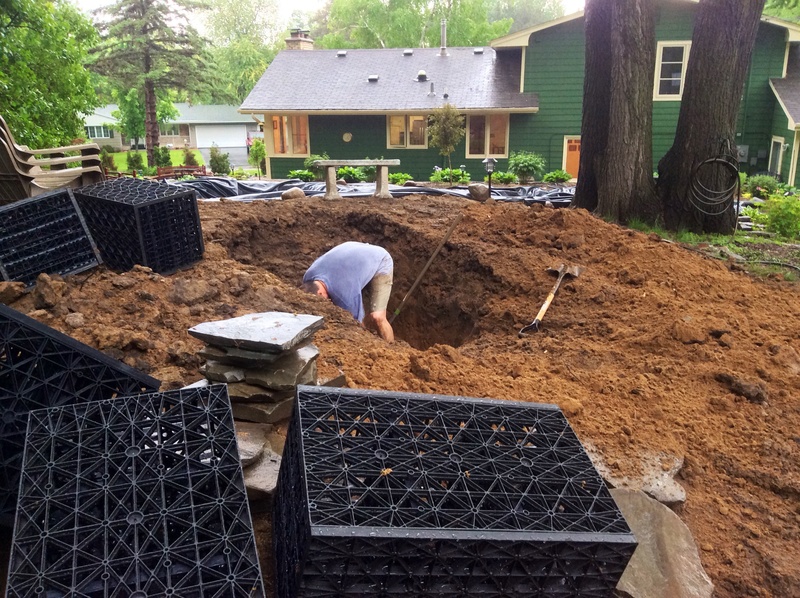 Not much work going on due to the weather but our biofilter pit is lined and the rocks to fill the res-cubes need to be washed. 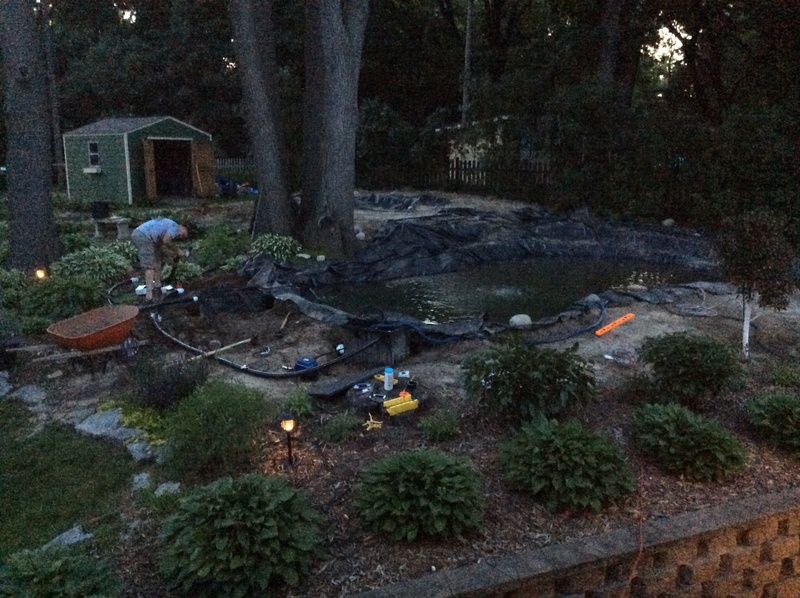 We filled the pond with water to help the liner settle into place and to figure out which edges need to be built up or taken down. It’s a rainy day today, in fact it’s supposed to be rainy all weekend. Weather is not a deterrent for my faithful pond digger. 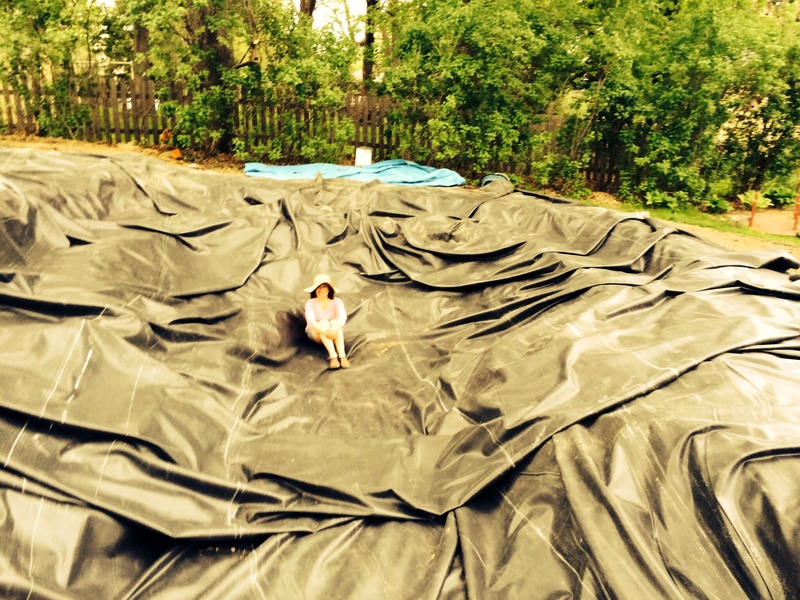 The weather terrorists were predicting thunderstorms over night so the big push today was getting the liner down. 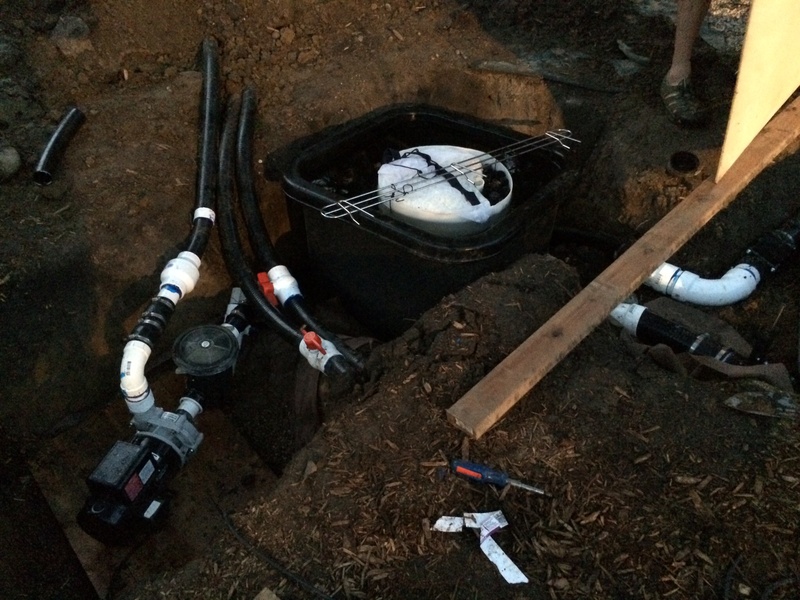 We decided to have bottom drains and had to do a little scrambling for some 3″ flexible PVC piping. Thank goodness for wonderful friends who happen to have this type of stuff and will share on Sunday of Memorial Day weekend. 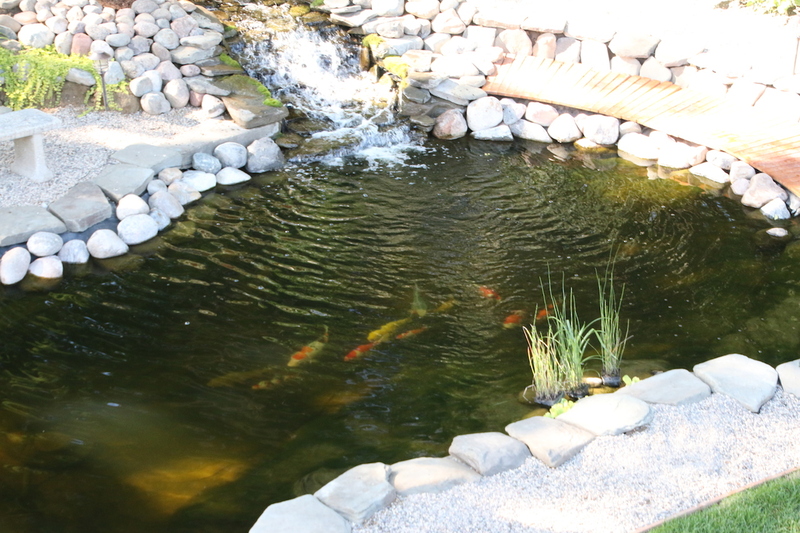 The members of the Upper Midwest Koi Club were also helpful, giving us some great advice. We kept hearing little rumbles and the skies became a little more overcast. I was definitely wondering how the two of us were going to manhandle the 600 pounds of liner by ourselves. Good thing Tony is very strong. 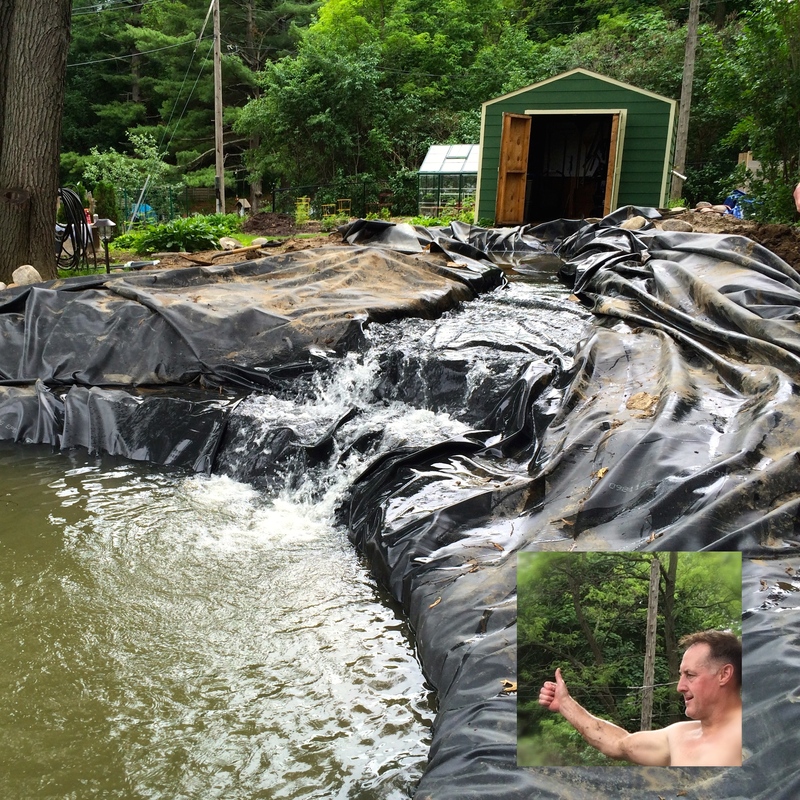 The liner is 40 x 50 feet and we first rolled it out with the 40 feet going the length of the pond (that’s how the roll has been placed the other day). Too short, sad face. 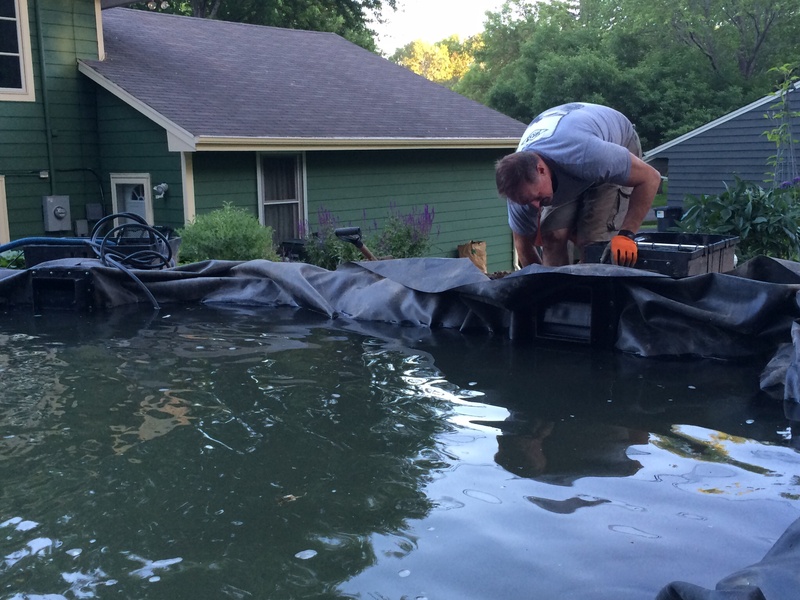 So we had to turn the liner. It was exhausting work. As we finished our work we felt a few little sprinkles. Weather holding, tomorrow will be another day of playing with the liner and underliner. 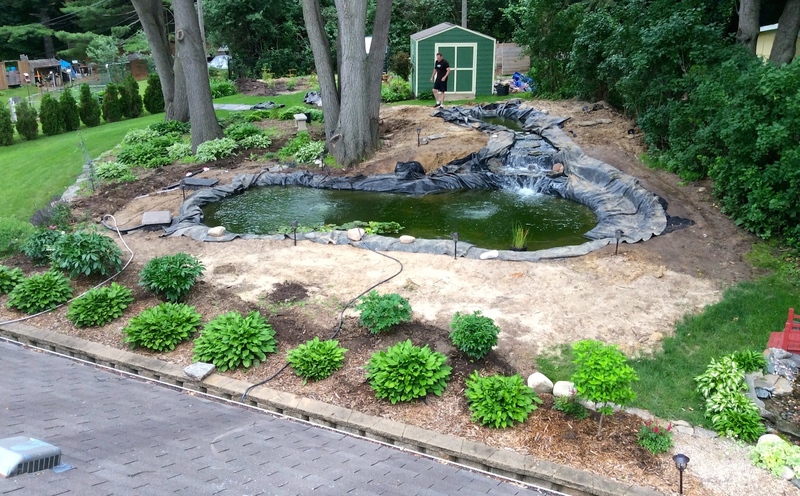 Tony has been hard at work on the new pond. We have shelves cut in, the giant dirt mound has been shaped into a more natural looking feature, the underliner and liner are here – it’s exciting! 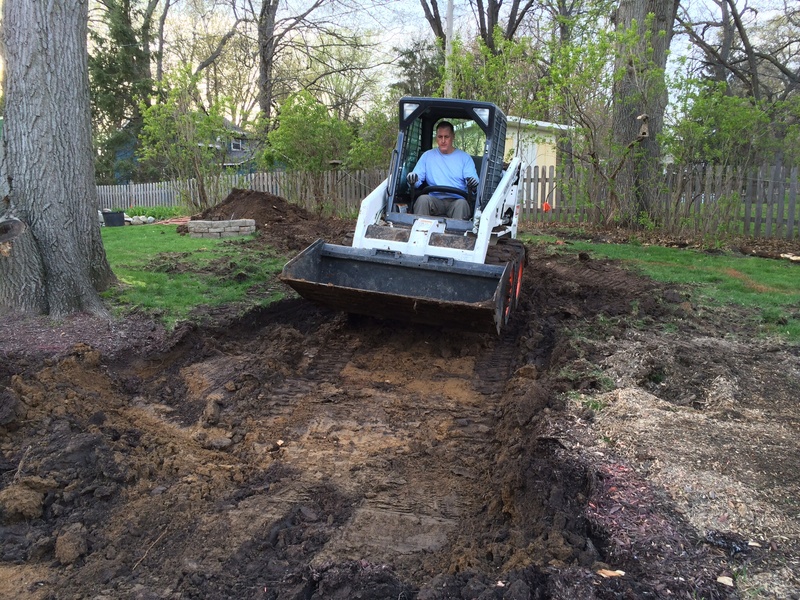 The use of the bobcat and the walk behind bobcat really made the work easier. We also had some help which is always nice. 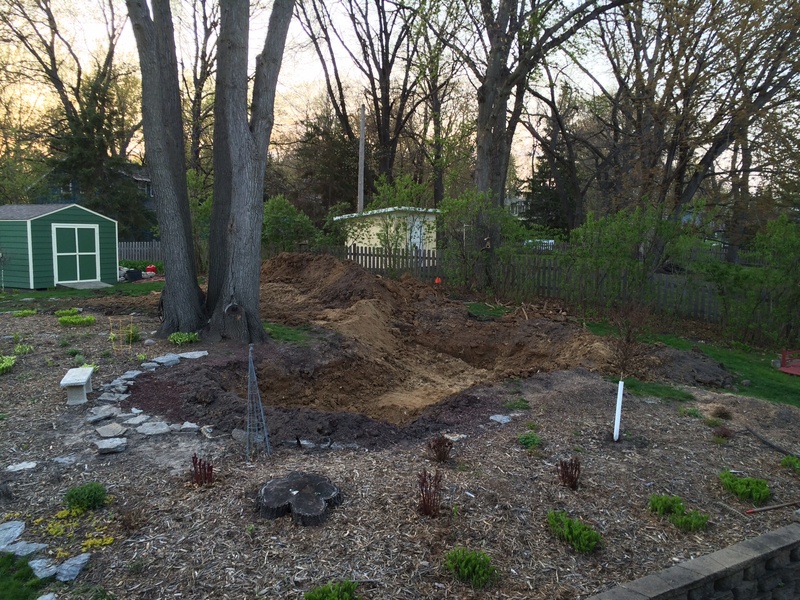 Racing a potential thunderstorm to dig and trench where the bottom drains will go. 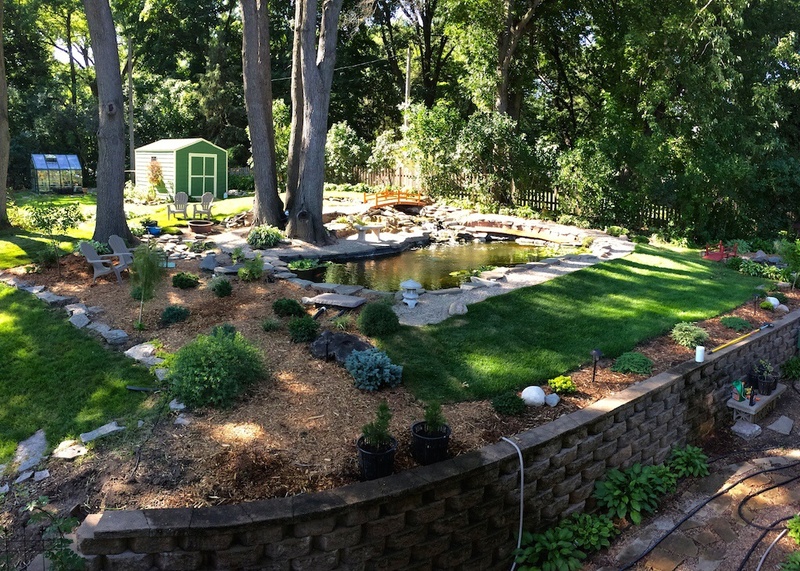 It’s been awhile since I’ve posted about the new pond since poor weather and traveling have kept us away from the 2014 pond work. Today we finally had the tree removers arrive and they took out the two tall oaks in the backyard. They also took out a large spruce in the front yard. Very exciting! We’ve scheduled a tree company to take down two tall oak trees in the backyard. Since we will be digging near the roots and they do drop a lot of leaves…it’s best to remove them. 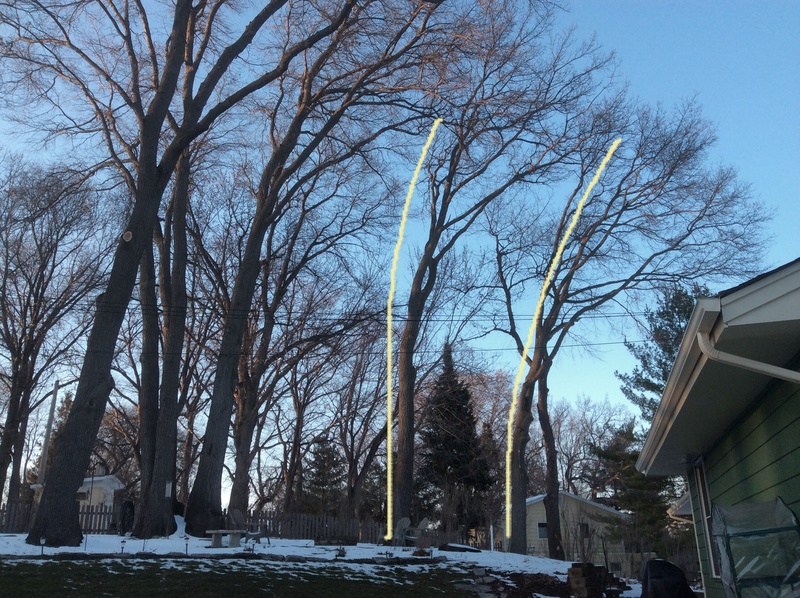 In about three weeks a crane will be placed in our front yard to safely take out the top halves of these trees. Still too early to dig in the yard. 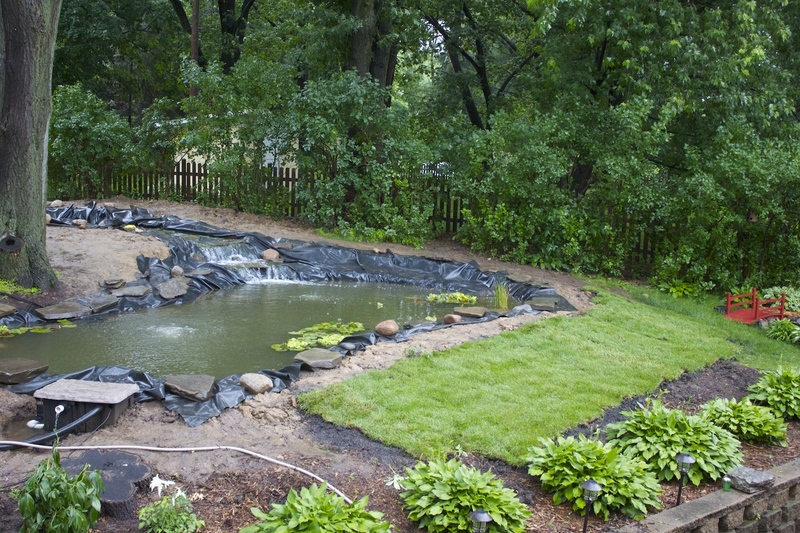 We can only dream about the next pond. 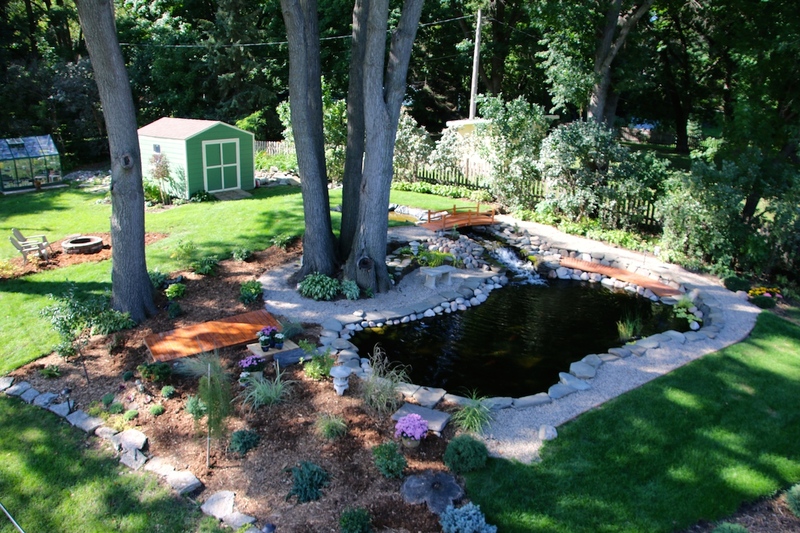 While we wait for the April snow to disappear, we can think about the possibility of a two tier pond. 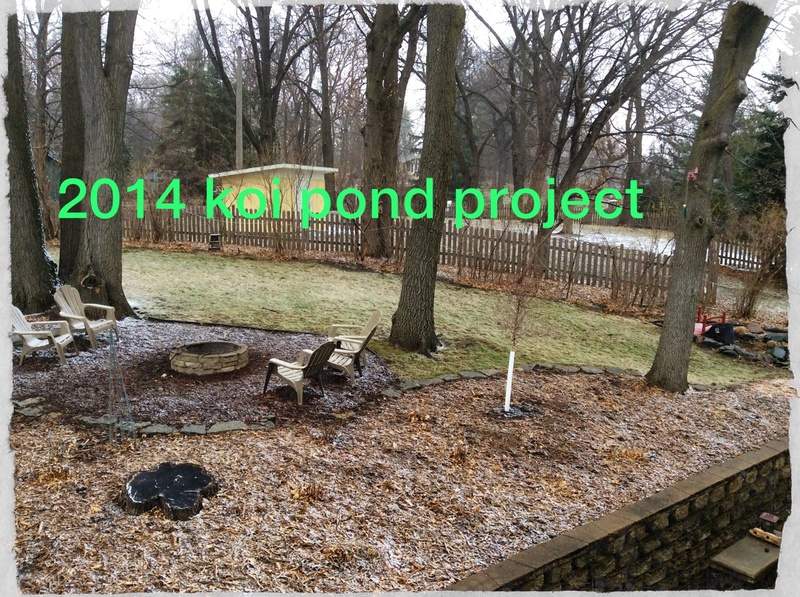 here’s the site for this year’s project. 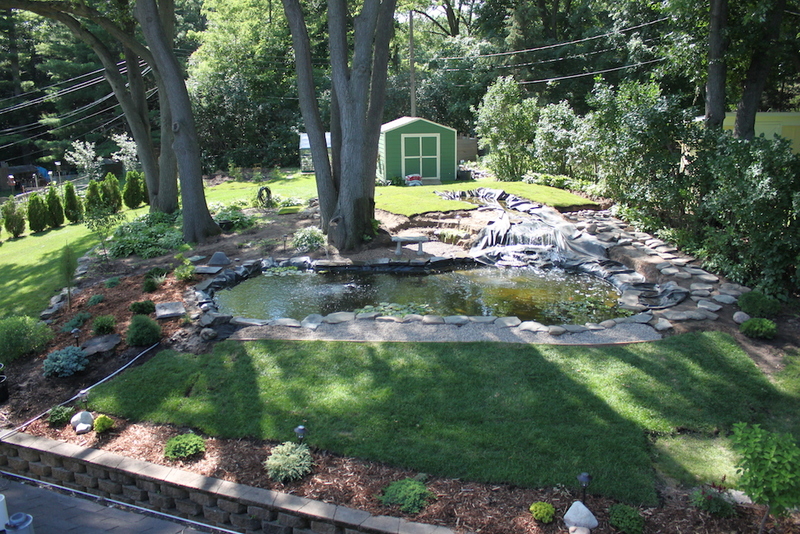 We’re thinking about a pond and some kind of pergola. 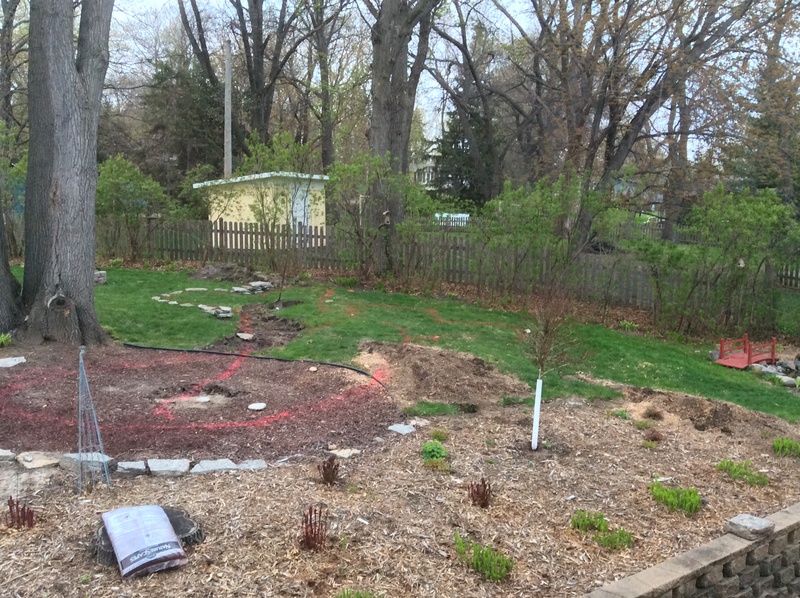 The fire pit will have to move and the two single stem oak trees will be taken down in about two weeks.